We’d love your help. 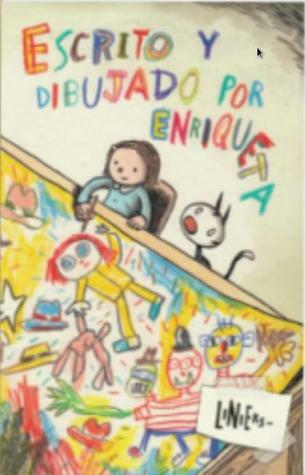 Let us know what’s wrong with this preview of Escrito y dibujado por Enriqueta by Liniers. Reading books is fun . . . but what about making them? Armed with new colored pencils, Henrietta's ready to try. Peek over her shoulder as she draws the story of a brave young girl, a three-headed monster, and an impossibly wide world of adventure. Whether read aloud to a toddler or discovered by a young reader, Liniers's celebration of the A Junior Library Guild Selection. Reading books is fun . . . but what about making them? Armed with new colored pencils, Henrietta's ready to try. Peek over her shoulder as she draws the story of a brave young girl, a three-headed monster, and an impossibly wide world of adventure. Whether read aloud to a toddler or discovered by a young reader, Liniers's celebration of the creative process is sure to make everyone want to bring out their pencils. To ask other readers questions about Escrito y dibujado por Enriqueta, please sign up. Great way to introduce a child to the creative process writers/artists go through. Ricardo Siri Liniers, known as Liniers, is the author of Macanudo, a daily comic strip hugely popular in Argentina, only recently available in English. His US debut, The Big Wet Balloon, a TOON Book, was nominated for an Eisner Award and chosen as one of Parents' Top 10 Children's Books. Francis Mouly, the editorial director of Toon Books, has in mind a pedagogical dimension to getting young kids interested in and educated about comics, so, since I have my own pedagogical interests in comics, ha Ricardo Siri Liniers, known as Liniers, is the author of Macanudo, a daily comic strip hugely popular in Argentina, only recently available in English. His US debut, The Big Wet Balloon, a TOON Book, was nominated for an Eisner Award and chosen as one of Parents' Top 10 Children's Books. Francis Mouly, the editorial director of Toon Books, has in mind a pedagogical dimension to getting young kids interested in and educated about comics, so, since I have my own pedagogical interests in comics, had read a bit of Macanudo and saw Liniers was the author this book, I thought I would review it briefly. Henrietta gets a box of colored pencils and sets off on a personal journey of discovery through storytelling and art. This is a fun, quirky choice for early readers - whether to encourage them to read themselves or to read to them. What I really liked about this book is how well it captures the imagination of a Henrietta - the book doesn't feel overly nostalgic or pandering to the experience of being a child discovering art and storytelling for the first time. There's even a darkness to some of H Henrietta gets a box of colored pencils and sets off on a personal journey of discovery through storytelling and art. Perfect for so many Writer's Workshop moments. Absolutely wonderful! Completely different from Liniers previous Toon Book but even more wonderful! We, the privileged reader, get to watch Henrietta as she creates her very own book "The Monster with Three Heads and Two Hats". This will inspire kids to make their own comic books and make grown-ups wish they hadn't forgotten how to draw like when they were kids. Splendid!! I liked Liniers' Big Wet Balloon but this was a notch or two higher. Loved this one. Perfect for Writers Workshop. Written by Ricardo Siri Liniers, the author of a daily comic strip popular in Argentina. A young girl, Henrietta, receives a new box of colored pencils and oh, the opportunities to create something special are endless. With the help of her cat, Fellini, Henrietta begins to create a book titled, "The Monster with Three Heads and Two Hats." She begins to narrator, write, and illustrate her own story with beautiful child-like drawings. What a great read for young students! I really enjoyed this grap Written by Ricardo Siri Liniers, the author of a daily comic strip popular in Argentina. What a great read for young students! I really enjoyed this graphic novel and I know my students will as well. The drawings and illustrations are very vibrant and pop out on the page. Themes presented in this graphic novel are determination and creativity along with individuality. The creative process is wonderfully shown here in this totally charming book. I love that Henrietta scares herself with her own plot and illustrations! Terrific concept well executed. I would love to use this in a classroom with kids! So amazing! You would think you were looking at a freshly colored with crayons book. The illustrations are so vivid and lively. Impossible not to be captivated by this title. The kids will love it!!! A delightful peek into the creative process. Henrietta has gotten a box of colored pencils from her mother and uses them to create and draw the story of Emily, a brave girl that goes on an adventure to help a three headed monster find a hat. Readers will be able to see Henrietta's imagination unfold right before their eyes as she writes and illustrates the story of Emily. This Toon Book by Argentinian author and comic strip writer Ricardo Liniers, takes us into the creative mind of a young writer and illustrator, and shows the writing proc Henrietta has gotten a box of colored pencils from her mother and uses them to create and draw the story of Emily, a brave girl that goes on an adventure to help a three headed monster find a hat. Readers will be able to see Henrietta's imagination unfold right before their eyes as she writes and illustrates the story of Emily. This Toon Book by Argentinian author and comic strip writer Ricardo Liniers, takes us into the creative mind of a young writer and illustrator, and shows the writing process through a child's eyes. The childlike illustrations "created" by Henrietta, will keep readers engaged because it will allow them to feel as they too can illustrate their own stories without fear of their work being perfect. A new book from the author of The Big Wet Balloon, this graphic novel for young readers encourages creating your own books. Henrietta has a new box of colored pencils and sets out to create her own book with help from her cat, Fellini. It becomes a tale of a brave girl named Henrietta who discovers a three-headed monster in her wardrobe. The wardrobe turns out to be a magic one, leading to a labyrinth filled with clothes. They search for a hat for the one head of the monster that doesn’t have on A new book from the author of The Big Wet Balloon, this graphic novel for young readers encourages creating your own books. Henrietta has a new box of colored pencils and sets out to create her own book with help from her cat, Fellini. It becomes a tale of a brave girl named Henrietta who discovers a three-headed monster in her wardrobe. The wardrobe turns out to be a magic one, leading to a labyrinth filled with clothes. They search for a hat for the one head of the monster that doesn’t have one to wear. But when they find a hat they also discover another monster, this one has one head and three hats. How will they escape? Liniers is a well-known Argentinian cartoonist. This book embraces the creative work of children, nicely capturing the simple story arc of a child as well as the colorful and loose art style. The creative process is also captured with asides from Henrietta to Fellini that show her having problems at times coming up with new ideas and at other times having problems with the continuation of the story line after something dramatic happens. It’s a clever way to demonstrate the hurdles of creativity and story writing without lecturing. The art is wonderful. Linier uses two clearly different styles in the book, one for Henrietta’s real world and the other for her written story. The real world ones are quieter and more realistic while the story is zany. It is filled with scribbles, colors, and really looks as if a creative child could have done it. The result is a book where the real world pieces are clearly different than the story, avoiding any confusion at all. Children love comic books. I learned to read when my parents got me a subscription to "Walt Disney's Comics & Stories" before I started school. And most children try to draw their own at an early age. In this delightful mostly-picture hardcover book for young readers, 7- or 8-year-old Henrietta sets out to draw her own comic book. The Argentinian author/artist Liniers shows her explaining what she's doing to her cat, Fellini. The 60-page book is a mixture of scenes of her drawing, with Fellin Children love comic books. I learned to read when my parents got me a subscription to "Walt Disney's Comics & Stories" before I started school. And most children try to draw their own at an early age. In this delightful mostly-picture hardcover book for young readers, 7- or 8-year-old Henrietta sets out to draw her own comic book. The Argentinian author/artist Liniers shows her explaining what she's doing to her cat, Fellini. The 60-page book is a mixture of scenes of her drawing, with Fellini watching, in Liniers' adult cartoon style, and Henrietta's pictures in a lively, colorful, chaotic child's scrawl. Henrietta's "The Monster With Three Heads And Two Hats" is clearly inspired by the comic books, books, and movies she's seen; a blend of Disney cartoons, monster movies, C. S. Lewis' "The Lion, the Witch, and the Wardrobe", and her own messy closet. Henrietta gets so engrossed in her tale that she's momentarily frightened when Fellini accidentally interrupts her at a scary moment. Henrietta's heroine Emily helps the ugly but friendly Monster With Three Heads to find a third hat. "That's it... Now, let's go look for a publisher," she tells Fellini when she's finished. Book talk K-2nd grade. Have an adventure and write your own story. Here's a book to show you how. I absolutely love this book because it is not something I would choose to read. It is more like a comic book. Henrietta is quite the narrator and story teller. The drawing are a little scary but the plot is great! I may look into more Toon books. Great comic book story that tells about writing a story beginning to middle to end. Love the child illustrations. It tells two stories in one. You gotta love LiNiErS. This grew on me as the (short) story progressed. Henrietta's cute, and it's an interesting concept. I remember playing while I was drawing when I was a kid, too. The line between author and audience is blurred. Children have a unique ability to be in such an unusual position. Henrietta loves reading books, and she decides that she wants to try writing her own! she writes her own story about a brave girl, a monster with three heads but only two hats, and an adventure all over the world. Read the book to find out what Henrietta does to help the monster with his hat problem! That was throughly enjoyable! A cute story-within-a-story graphic novel, there was so much to like about Henrietta's imaginative tale. What with it's references to writer's process, allusions to other works, and speckled vocabulary, I felt like this was a good read for an adult-child duo. Enough suspense and color to keep a younger reader capitvated and enough substance to amuse an older one. I came across this book while looking through leveled readers and instantly fell in love with the story. I found it absolutely hilarious and often found myself laughing out loud. It was a very creative mode of story telling and I really enjoyed the vibrant children's style artwork. It pulled me in and I'm sure it would do the same to other readers of all ages. This was a cute story! I think kids 2nd to 4th grade, maybe 5th would enjoy it! It's like a book they can write themselves! The illustrations were really cute and child-like! This would make a great gift for ta child who likes to make their own books! Nombre con el que firma el historietista Ricardo Liniers Siri. Ricardo Liniers lives in Buenos Aires with his wife and two daughters, who inspired this story. For more than ten years, he has published a hugely popular daily strip, Macanudo, in the Argentine newspaper La Nación. He also tours the world drawing onstage with musician Kevin Johansen. His work has been published in nine countries from B Nombre con el que firma el historietista Ricardo Liniers Siri.